Why Use an Interactive Kiosk? Interactive kiosks are a great trade show or event tool to attract visitors, exchange info, generate social media buzz and produce leads in an engaging and entertaining manner. Interactive kiosks can take the form of touch screen monitors or tablets, interactive walls, pedestal kiosks and also include other peripherals such as cameras, scanners, scales, printers and other devices. 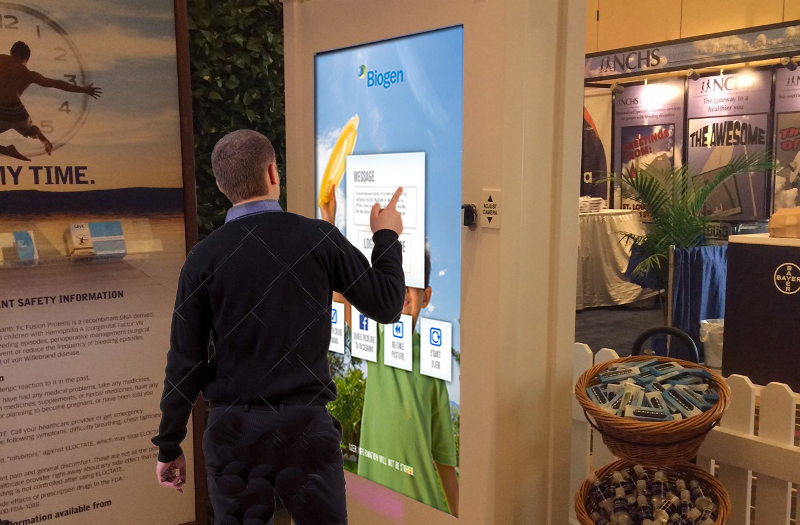 A carefully designed interactive kiosk is customized to use the right mix of technology, messaging and signage that will be of value to both visitors and exhibitors. Interactive displays are effective because they encourage engagement with your digital content and are self-guided, offering a more customized, enjoyable and even entertaining experience. Kiosks can capture people who are more inclined to engage with a screen than talk to a sales rep. A user-friendly, eye catching, interface invites visitors to explore on their own, providing each visitor with a customized experience. Their experience with the kiosk enhances connection to your brand and increases product understanding. So what does your kiosk program do? Touch screen interactive kiosks can be developed to function as an interactive digital catalog, a sales presentation tool, a virtual product exploration station or even simply to add a gaming component to your booth or experience. And they can be found in most any environment where people are gathered to learn, interact or play such as trade shows, marketing events, museums or visitor centers. They can be used to display and share virtually any type of digital content from video and animations to spec sheets and digital brochures. Plus they can be a valuable tool for you in collecting visitor data and analytics. Media Dynamics can harness the power of interactivity in your next display or experiential marketing event. We have the storytelling, design, software development, analytics tracking and hardware integration experience to attract and engage visitors by delivering a customized, engaging, interactive experience.